Artist's impression of the two groups of Trojans that accompany Jupiter in its orbit. Image credit: NASA/JPL-Caltech. The locations of Jupiter Trojans. A Trojan is an object located at either of the stable Lagrangian points (L4 or L5) of a larger object's orbit. The term comes from the theme of the names given to the first asteroids to be found at Jupiter's Lagrangian points, Achilles, Patroclus, and Hektor – characters in Homer's epic poem about the Trojan War, the Iliad. Unless qualified, "Trojan" is assumed to mean "Jupiter Trojan." There is one known Earth Trojan (the 300-meter-wide 2010TK7), seven known Mars Trojans, and 17 known Neptune Trojans. Searches have so far failed to uncover any similar objects in the orbits of any of the other planets. Saturn's satellites Helene, Calypso, and Telesto are also sometimes called Trojans because they lie at the leading Lagrangian point of Dione, and at the trailing and leading Lagrangian points of Tethys, respectively. The Jupiter Trojans occupy two banana-shaped regions, centered 60° ahead and behind the planet, which can be considered the "Greek" and "Trojan" nodes, respectively; only Hektor in the Greek node and Patroclus in the Trojan node are, so to speak, in the camps of the enemy. 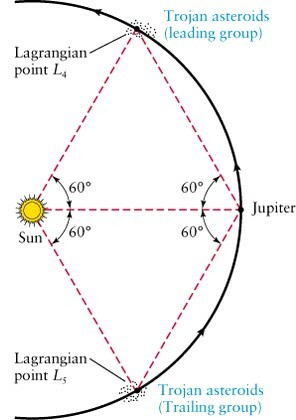 Perturbations by other planets, principally Saturn, cause the Trojans to oscillate about the Lagrangian points in an arc about 45–80° from Jupiter with a period of 150–200 years. About 1,750 Jupiter Trojans are known, with 40% more in the leading group than the trailing group; most don't move in the plane of the planet's orbit but rather in orbits inclined by up to 40°. Astronomers are still not certain where the Jupiter Trojans came from although observations by NASA's WISE (Wide-field Infrared Survey Explorer) published in 2012 have shed new light on this question. The traditional theory about the origin of the Jupiter Trojans argues that they formed near Jupiter while the planet itself was coming together, some 4.6 billion years ago. If this were true, the Trojans would be expected to have a rock and ice composition similar to the Jovian moons Callisto and Ganymede. An alternative theory, put forward in May 2005 by an international team of researchers,1 suggests that Jupiter, Saturn, Uranus and Neptune originally formed in a once-densely-filled area close to the Sun, in a great disk of innumerable small bodies, called planetesimals. This circling disk can be likened to a kind of primordial Kuiper Belt – the region of objects which now lies beyond Neptune. This conclusion came from computer simulations which indicated that it was not until 650 million years after the planets formed that they arrived in their current orbits, having undergone a chaotic migration outwards, flinging planetesimals as they went. Some of these icy bodies, this alternative theory suggests, were captured by Jupiter as Trojans rather than migrating to the Kuiper Belt. However, the newer data from WISE favor the traditional theory. WISE has found that most of the Trojans in both the leading and trailing groups have the spectroscopic signatures of D-type asteroids, being composed dark, reddish rocks with a matte, non-reflecting surface. This makes them quite unlike typical asteroids from the main belt between Mars and Jupiter and also from objects in the Kuiper Belt. The rest of the Trojans look like C- and P-class asteroids with gray-bluish surfaces. If Trojans were indeed captured by Jupiter locally in the earliest days of the Solar System that would be fascinating to astronomers because it would mean they could study primordial material from this region of the Solar System. A Mars Trojan is an asteroid located at either of the stable Lagrangian points of the orbit of Mars. Seven have been identified, including 5261 Eureka, an A-type asteroid discovered in 1990. Six of these are at the trailing (L5) point and one at the ;eading (L4) point. 1. A. Morbidelli, H. F., Levison, K. Tsiganis, and R. Gomes. "Chaotic capture of Jupiter's Trojan asteroids in the early Solar System." Nature 435, 462-465, 2005.